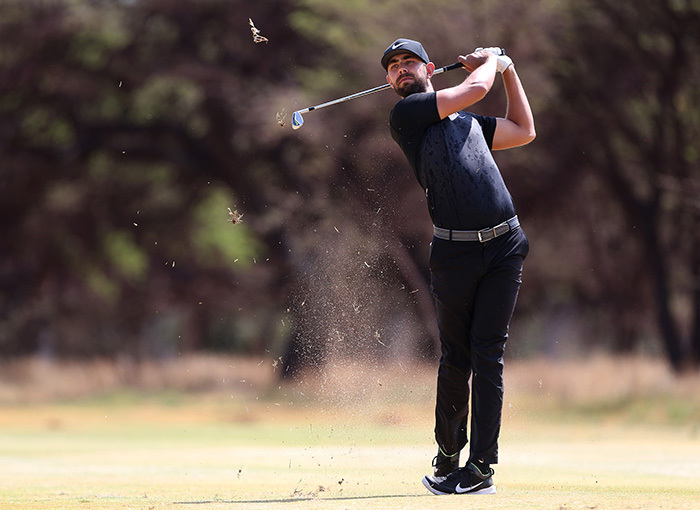 For the regular golfer, getting up close and personal with a professional player during a round of golf is usually restricted to a rare invite to a pro-am before an event and even then that is beyond 95% of club golfers, writes Wade Pretorius. A pro-am also comes with some stumbling blocks to getting the most of the experience as the pro is there for business of preparing for the event starting the following day. It’s fair to assume his mind is on other things, and rightly so, golf is his 9-5 after all. The Sunshine Tour hosted the sixth Media Challenge at Glendower last week and pits, almost unfairly, 50 underprepared media personalities against 50 pros in a matchplay competition. The event gives the media a chance to play against the best talent on offer in the country in a more ‘relaxed’ environment. Relaxed is a relative term as the pros don’t have the pressure of heading into a tournament but they certainly weren’t ready to lose their 5-0 winning record as the mental games started well before tee time. I was paired against Erik Van Rooyen, a young, athletic long-hitting pro from Cape Town, and we had a wonderful battle on the course (which was a worthy follow up to our social media jibes which flew before game day) although being at least 50m behind him after every drive was less than ideal. Jacques Kruyswijk, a close friend of Van Rooyen on tour, was the other pro in my fourball and both players contributed to a fun round of golf as they did their best to encourage us amateurs despite the duffs, the shanks, the three putts and the drives out of bounds that inevitably followed. These young pros gave us a good indication of what it takes to make a career out of the sport that many play for fun. Simply put you need to practise until the blisters prevent you from continuing, having a good handle on the mental side of the game as well as being able to hit the ball a mile, dead straight and the gentlest of touches around the greens in order to succeed. Back to my battle with Van Rooyen – a player who has only missed one cut on the Tour this year – who took advantage of the early nerves to go one up after one. Some miraculous recovery shots combined with my 13 handicap meant I walked into the clubhouse comfortably ahead. My enthusiasm was not matched by my fellow media challenger, who shall remain unnamed to protect his bruised reputations, who was at least six down at the turn as Kruyswijk took no prisoners. Erik promised me a comeback and he duly backed up his words with a birdie at the 10th but that was only good enough for the half with my stroke negating his three. He then won the 11th without any hassle and then a couple more holes after that but I managed to stop the rot and salvage a couple of halves to keep myself in front. With my lead down to one and the nerves beginning to show, I somehow grew in confidence and hit two consecutive greens in regulation to secure the win on my debut at the event. Van Rooyen and Kruyswijk had a personal game alongside our matches and it was a brilliantly fought contest with the former sinking his birdie putt, his second on the trot, on the last to ensure the 1up win. No matter the personal match result between the media and their selected professional, it appeared that not one of the 100 players in the event had anything less than a wonderful time at the event despite the pros cruising to victory. The pros were particularly hospitable and chatted openly and frankly throughout the round and even went as far as offering a target line on a drive. That helpfulness didn’t make its way onto the greens but then again, they have their 100% record to protect.